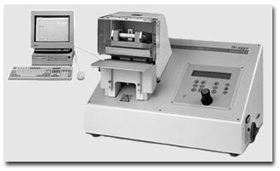 The HSG-C is designed for testing the heat sealability of varnished or coated films. The HSG-C has a removable pair of sealing jaws which temperature may be individually set between ambient temperature and 300°C. In addition, you may control the dwell time and the sealing force. The actual and set temperatures as well as the dwell time and sealing force are shown in the display. If your lab is not equipped with a compressed-air supply, use our special HSG-C Compressor Version. You may wish to obtain our special software to evaluate the results for documentation purposes. For sealing jaws with a smooth surface the sealing pressure will be automatically calculated and displayed from the set sealing force. Test the seam strength of the sealed samples with our Universal Tensile Tester VNG-E.
An optional Hot Tack Device can be obtained as an accessory. Also, an optional load cell enables you to adjust the force display any time. You may adjust the Temperature, Force and Time parameters with our newly developed HSG-P testing device. Compressed-air supply 10 bar max. Electrical connection HSG-C (Desktop Version) 230 V/50 - 60 Hz, power consumption 600 W, approx. Electrical connection PC 230 V/50 - 60 Hz, power consumption 50 W, approx. Electrical connection monitor 230 V/50 - 60 Hz, power consumption 150 W, approx.